Blends Reading Passages are perfect for practicing comprehension, fluency and phonics all at once. Each of the included pages focuses on one specific blend. The silly stories will keep students engaged and the format will help them complete the activities independently for homework or during your reading block. BUY ALL OF MY READING PASSAGES IN A BUNDLE AND SAVE! These no-prep passages are the perfect addition to any reading program. This phonics skill practice can be used to address comprehension, fluency, cold reads and even assessments. 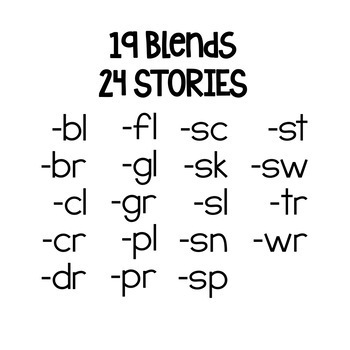 These stories contain more than just basic sight words and are best for (in my opinion) higher 1st, or 2nd/3rd graders but please download the preview to get an idea of the levels. DOWNLOAD THE FREEBIE FOR TWO PASSAGES TO TRY! LOOKING FOR MORE FLUENCY & COMPREHENSION PRACTICE? 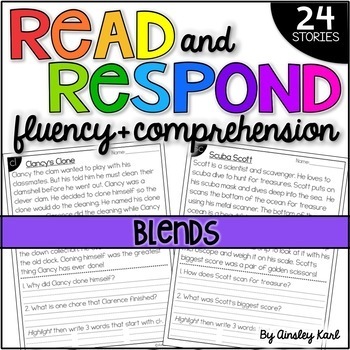 CLICK HERE TO SEE ALL OF MY FLUENCY & COMPREHENSION PRODUCTS! Click the ★ above to follow me for my newest freebies and products!